However, the amount can vary from dog to dog. Some Pomskies have shorter fine hair and others longer thicker hair. As a general rule Pomskies blow their coat twice a year when losing their winter and summer coats, this is due to them being double coated and so they shed their thicker winter undercoat ready for the summer and vice versa. It is easy to keep on top of shedding by using a good brush, we recommend using a rake which will comb out any loose or dead undercoat from your Pomsky. Do Pomskies have health problems? As Pomskies are a relatively new breed we still have a lot to learn in regards to their health, this is why all our parents are routinely health checked and are BVA tested in accordance with the kennel club guidelines before breeding. We do recommend that as with any breed of dog, you should thoroughly research any potential health issues which may be apparent in the foundation breed; in this case the Husky and Pomeranian. To date the main issues that have been bought to light are that they can on occasion suffer from a build up of plaque and the possibility of hip and elbow dysplasia within the breed. 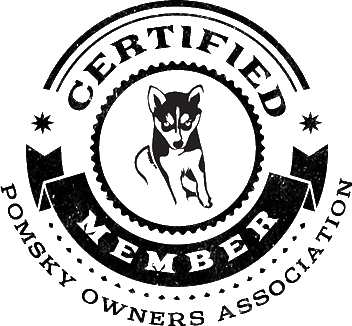 How EASY ARE POMSKIES TO TRAIN? Pomskies are a highly intelligent animal and are very food orientated so are quick to pick up on commands especially when there is a treat involved. We do aim to start basic training with your puppy before they leave us and so will come to you with some understanding of basic commands. What do i get when i buy a pomsky puppy from you? When you buy a puppy from Prestige Pomskies, you can be assured that your puppy has had plenty of time, love and cuddles put into it. Our puppies are all well socialised with both adults, children and other dogs and will have started toilet training and learning commands. Before our puppies leave us they are checked over by the vet to ensure they are fit and healthy. Your puppy will be vaccinated, worm and microchipped. We send all our puppies home with a new puppy pack, which will contain a blanket with mums scent on, food, toys and treats. We also send all our puppies home with 4 weeks free Petplan insurance. All our puppies are sold on a pet only basis, if you wish to breed this will be discussed on a case by case basis. You also get ongoing support and advice from us 365 days a year to help you with the upbringing of your puppy and an extensive 12 month health guarantee. As part of our development of the breed we do request that our owners update us with weights and height on a minimum 3 monthly basis until their puppy is 18 months old and report any health issues to us. What does f1, f2,f3 and f1b mean? Within Pomsky breeders and owners you will currently notice these terminologies being used on a regular basis. These terminologies refer to the generation of the Pomsky. For Instance; An F1 Pomsky is the first generation of the Pomsky breed so will have a Pedigree Husky mother and Pedigree Pomeranian Father. A second generation Pomsky therefore is known as a F2 and is made up of a Pomsky mother and a Pomsky father and a F3 is a third generation Pomsky which would be from an F2 Mother and Father. Are Pomskies good with children and other pets? Pomskies are a perfect addition to any family, young or old and even those with other furries. Our Pomsky puppies are bought up in a busy household enviroment around two young children, so will be used to being handled by children from a very young age and so will come to you already socialised with children to give them a headstart in life. Pomskies are by nature pack animals and so are very sociable, provided introduced properly to other furries in the household there is no reason why they cannot all become the best of friends. With the Pomsky being a relativley new breed we do not have any offical data to go off in respect of this. Based on the foundation breeds of the Husky and Pomeranian however, the expected life span of a Pomsky is around 12-15 years. Ensuring your Pomsky has a well balanced active lifestyle and healthy diet will help your Pomsky to life the longest life possible.